FedEx employees uncovered 50 pounds of marijuana packaged for shipment at their facility in Windsor Locks on Friday. Fifty pounds of marijuana and marijuana-laced candy were discovered at the FedEx facility at 100 Old County Circle in Windsor Locks. 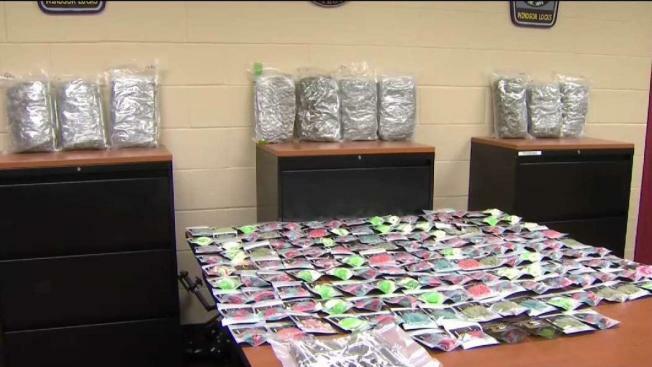 Police said they received a call from the facility Friday morning after staff inspected a damaged package and they found more than 100 bags of marijuana-laced candies, 10 bags filled with marijuana plants and a large bag filled with syringes containing an unidentified drug. “Early indications say that it was dropped off there to be shipped to an address locally, not with in Windsor Locks, but within the region of central Connecticut,” Lt Paul Cherniack, of the Windsor Locks Police Department, said. The smaller bags were designed to disguise its true contents by making it as inconspicuous as possible, police said. “Our concern is that it is packaged like an edible candy which may be attractive to children. The bags were smaller and labeled as if it were a store bought candy. Nowhere on the labels does it advise what the true contents are. Parents could have a difficult time discerning its actual content and potentially dangerous properties,” a news release from police said. They also found dozens of hypodermic needles loaded with a brown liquid substance suspected to be a cannabis derivative. The police investigation is underway and authorities said the preliminary information suggests that the package 2as dropped at the facility and was being shipped within the state. They are trying to track down where the package came from and where it was going. The street value of what police located is as much as $25,000, according to police.